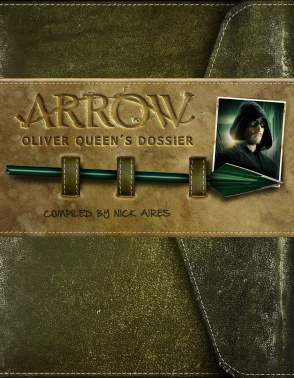 Oliver Queen's Dossier is a stunning in-universe exploration of intelligence and information that Oliver Queen has collated on nefarious business dealings and criminal activity in Starling City. Including hard copy duplicates of confidential government and business documents acquired by Oliver and Felicity Smoak, top secret schematics for Arrow's weaponry and information on his family and allies, Arrow: Oliver Queen's Dossier will delight fans and allow them to be immersed further into the DC Super Hero's world. Arrow is the hit Warner Bros. Television series that follows billionaire Oliver Queen, who returns home, after being stranded on a hostile island for five years, determined to right the wrongs in Starling City by adopting the guise of the vigilante Arrow. The first season stars Stephen Amell, Katie Cassidy, Colin Donnell, David Ramsey, Willa Holland and Emily Bett Rickards with Colton Haynes, Manu Bennett, Susanna Thompson and Paul Blackthorne. Produced by Bonanza Productions, Inc. in association with Berlanti Productions and Warner Bros. Television, the first season reached an average of 3.2 million viewers in the US. Season 5 of Arrow will return to The CW channel on 5th October. Nick Aires is the pen-name of Nick Andreychuk, a seasoned fiction and non-fiction writer in the genres of fantasy and horror, contributor to the official Supernatural Magazine, and author of Arrow: Heroes and Villains and the Official Companions to seasons 1-7 of Supernatural. He has also worked as an extra on numerous Vancouver-based TV shows.